OK, so I admit - sometimes a writer's life is not at all bad! Most people would call it a holiday, but it goes down in the accounts as research. On the quayside of Rovinj with the 'centro storico' in the background. Settings are very important - Catherine Cookson always said that she chose characters and an environment and the whole novel came out of the conflict between the two. One writer I know deliberately thinks of the most romantic destinations she can and then sets her new book in one of them - a great excuse to go off for a month or so to soak up the atmosphere. I set my latest novel in Istria, Croatia for very different reasons (honest!) I wanted a location that hadn't been overused and wouldn't be all that familiar to the reader, and I wanted somewhere with a troubled, but reasonably safe, atmosphere. There had to be an undertow of unease from past events, to echo what is happening in the lives of the two main characters. Croatia has had a stormy past, belonging to several different countries in the last hundred years; torn apart during the second world war and then again in the recent civil war. Istria, a very distinct part of Croatia which used to belong to Italy, is not only unique, it's also very beautiful. It's the kind of place people might go to if they wanted to find peace in their lives. It's very important to me to get the detail of a novel right - I want the reader to feel that they are there, sharing the experience. I want to create a real landscape in their imaginations. For me, that means being able to provide the telling details. The characters can't walk across an empty stage, there has to be scenery, and it's got to be good. I also want to take the reader somewhere unfamiliar - I want them to find both the setting and the characters seductive. One of the central characters of the novel, Zenobia, an ageing painter with a controversial past, is Italian, born in Trieste at a time when Istria was part of Italy. She and her brother had been partisans at the end of the second world war and some of the tragic events in her life are a result of this political involvement. Zenobia has a cousin who is very influential in right-wing Italian politics - a friend of Berlusconi - and, at the end of her life, she once again finds herself having to deal with a rapidly changing European landscape. Zenobia and Lucia rented an apartment above a pastry shop - could this be it? Zenobia's entire life has been a search for personal fulfillment and a stable relationship and she has never been afraid to risk scandal. When she was at art college in Venice just after the war, Zenobia fell in love with Lucia, the young and unhappy wife of a Venetian banker. They ran away together across the Adriatic to Istria, and lived in a tiny apartment, lent by another student, until their families came to take them away. I needed to find the right location for the hideaway and there are only two places where you can get a ferry to Venice - Pula and Rovinj. Pula seemed too big, so I opted for Rovinj - a colourful fishing village with a long history. 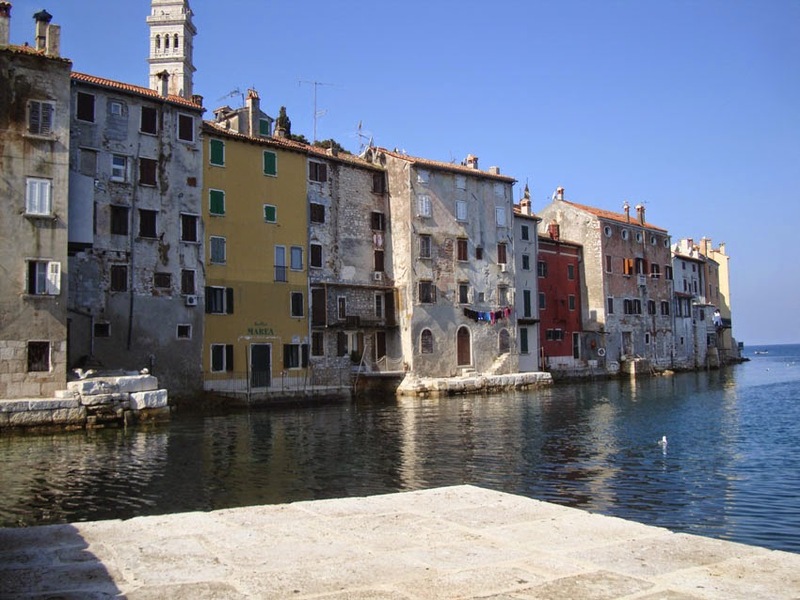 Rovinj is only an hour's drive from Trieste and Zenobia would have known it well. So that is where she eloped with Lucia. 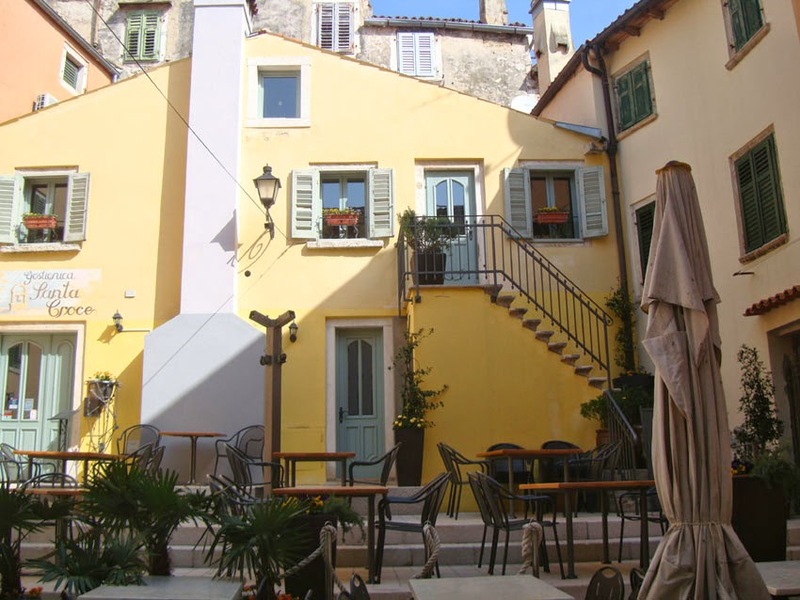 In Rovinj I found a number of apartments that seemed suitable, and looked at bars and restaurants that they might have visited. It's one of the most beautiful places I've ever been to, and rapidly recovering from the ravages of war and economic hardship. Buildings are being reconstructed and there are now good roads everywhere. As a successful artist in the 1960s and 70s, Zenobia found a ruined hilltop village - many of them were abandoned after the second world war - bought the houses for very little money and then rebuilt them to make an artist's community where she hoped to gather creative people around her. So I needed a suitable hill village, isolated enough, but with views of the Adriatic. There were a few candidates for the location. 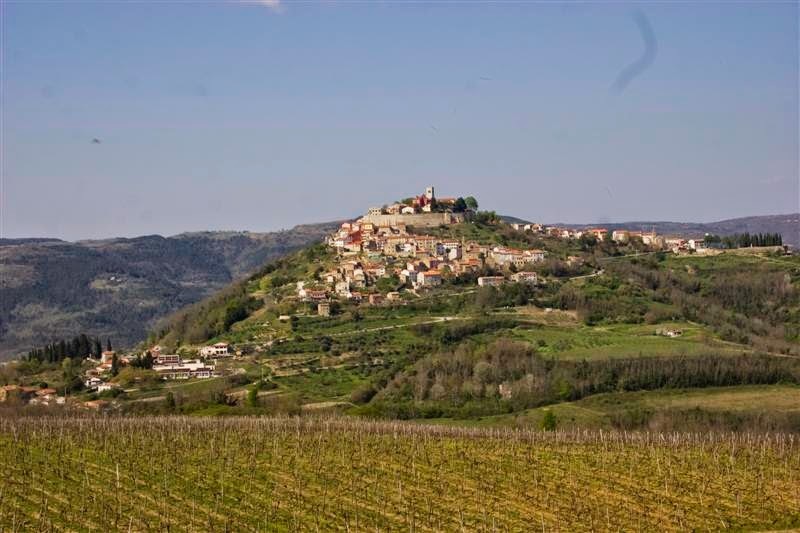 Motovun is almost right - perhaps a little too big, but it has an old, walled citadel with a modern village sprawled around it, just like the Kastel Visoko in the novel. The big drawback is that you can't see the sea from the terraces. Grosjnan, a village that has an annual music festival, was probably the nearest fit - smaller, and with lovely views of the Adriatic. 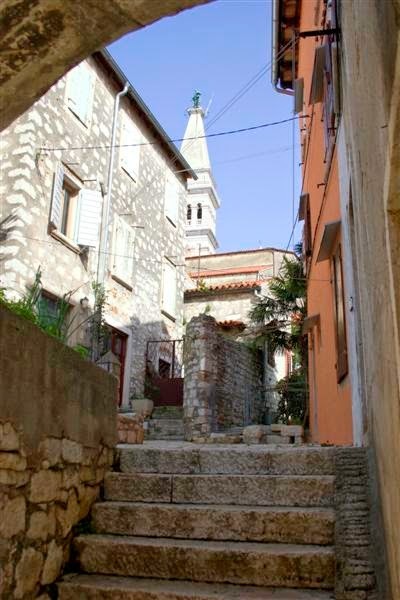 In the end, the Kastel Visoko where Zenia lives with a collection of friends, is a blend of both. It was important too, to get the flora and fauna right. 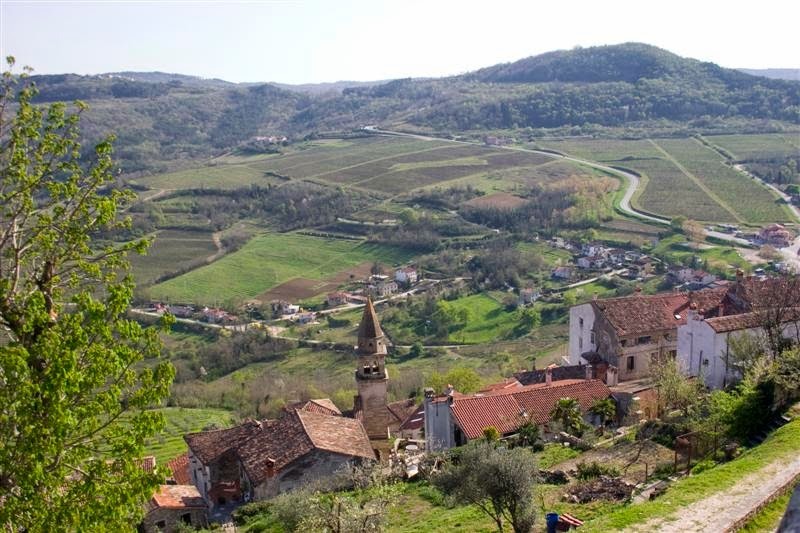 Istria has vineyards and olive groves and fields of lavender, but also scrubby woodlands of oak and acacia - vast acreages uncultivated because the area is so sparsely populated. When Alex, Zenobia's biographer, drives up into the hills to meet her for the first time, I want the reader to see what is actually there on either side of the road. We covered a lot of miles in Istria, (and drank a lot of Croatian wine) but hopefully it will make The Centauress a better book. By the time you read this, I will actually be in Oslo, Norway - but that's another story! A fascinating post, Kathleen. A vivid and well-realised setting can draw the reader directly into the characters’ world and allow them almost to experience the story themselves. This is one thing that I certainly appreciate as a reader! The novel sounds fascinating – can’t wait to read it. Oh yes, what better reason to travel! I also have a simmering novel ... it took me to Liverpool! Which was fun, but next time I'll find somewhere more scenic. oh research, how we love it! yours looks wonderful, but so important too, to convey the spirit of place which is one of the reasons many of us read - to enter other worlds. I've never been to Croatia, it looks beautiful.